Moving gradually toward winter—and a new farm. Just over a week ago, I was sweating through some crazy humidity while trying to protect the farm from Hurricane Michael. This morning, I’m wearing slippers and drinking tea, while outside the temperature just dipped down to 32 degrees. Our first frost! No matter what the forecast says, the first frost always catches me off guard. It marks a dramatic turn in the farm year. The last peppers and eggplants wither, all the pretty flowers die, and the time of lush growth suddenly ends. 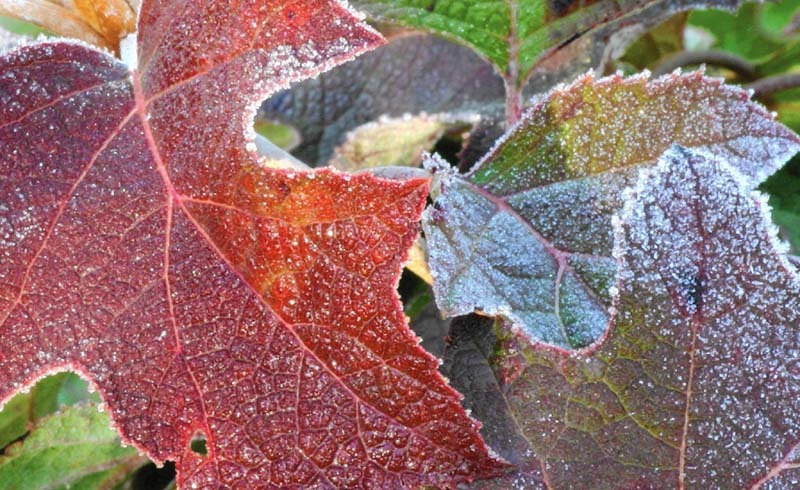 For many farmers, the first frost signals the end of their growing season and the beginning of sit-by-the-fire season. 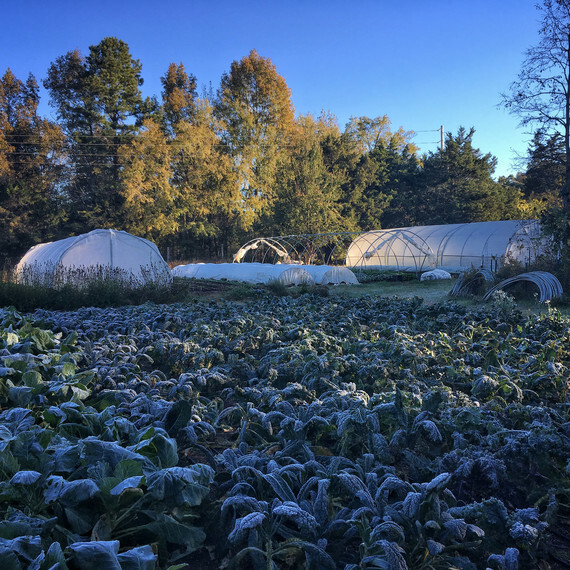 But for farmers who grow winter vegetables, the first frost just means a shift in their daily work. The main job now is keeping plants protected from the cold. 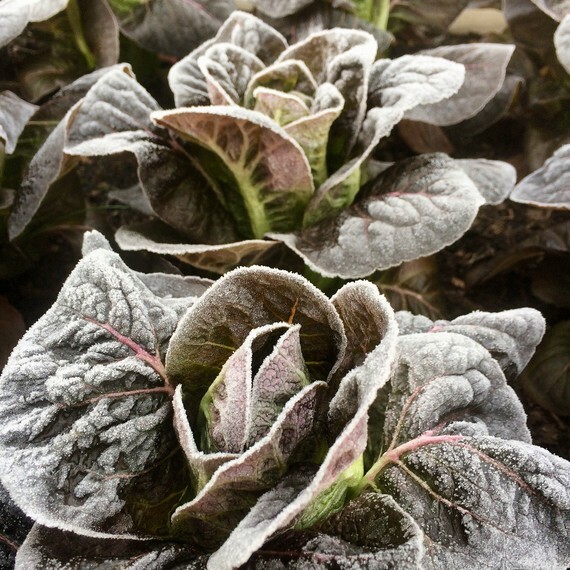 Frost-kissed lettuce is sweeter than any other. 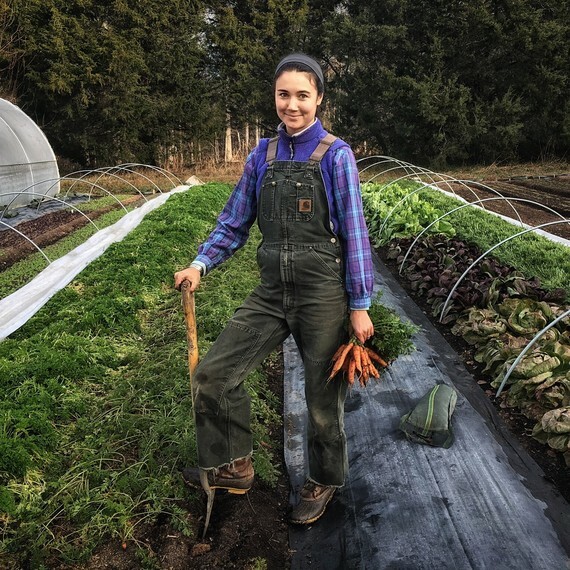 Growing vegetables in cold weather is very different than farming during the warmer months. For the most part, the plants aren’t growing—they’re just holding tight and trying to survive until spring. During the darkest days of winter, when the day length dips below 10 hours, plant growth actually comes to a complete stop. Here in central North Carolina, that period runs from mid-December to mid-January. The key to winter farming is timing your planting so that crops size up before the 10-hour mark. Then you’re just keeping them alive and harvesting. Gordon in the hoop house: Just one layer of plastic in a high tunnel or hoop house can protect plants from freezing temperatures. How do you keep them alive? 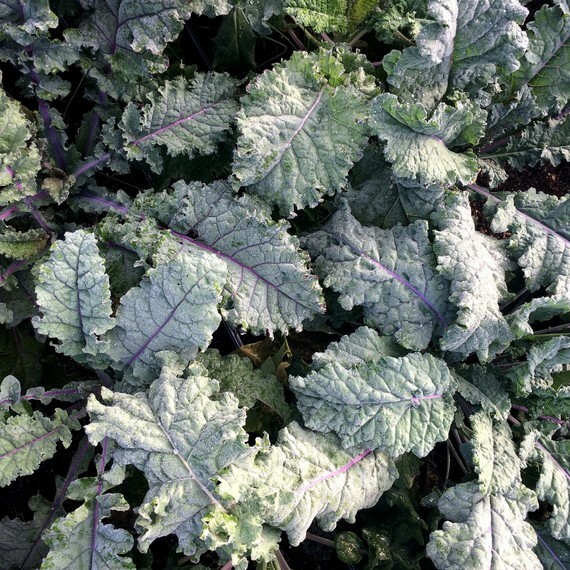 Choosing cold-hardy crops is part of it: spinach, carrots, collards, mustard greens, and a few other salad crops can generally handle sub-freezing weather. But it helps to keep them cozy, which we do by growing them in high tunnels (which are like low-tech greenhouses without a furnace—just a steel frame and a layer or two of clear plastic) and by covering the beds with “row cover” (which is like a thin woven blanket designed specifically for winter farming). 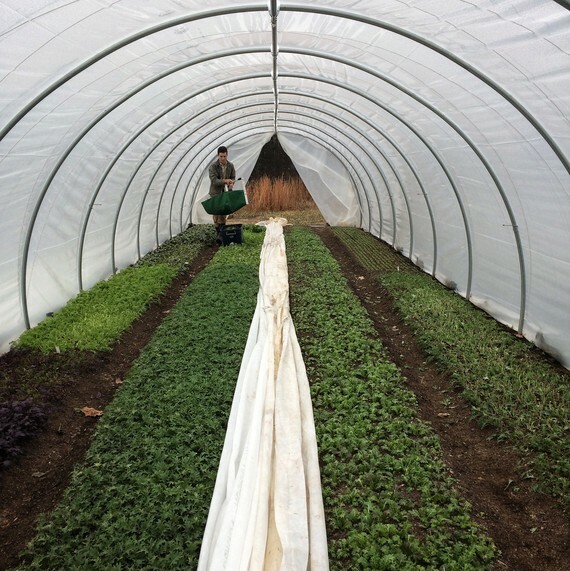 It’s amazing what a single layer of plastic on a high tunnel can do to trap sunlight; on sunny days, it can be below freezing outside and well over 70 degrees inside. It’s so effective, actually, that we have to be careful about ventilation: if we left that tunnel sealed up on a sunny day, it wouldn’t take long for it to heat up to over 100 and kill all the crops inside. Keeping the plants warm at night but not too warm during the day is a delicate balance and requires a lot of work and some careful attention to the weather. Overnight, the kale crop becomes more delicious. Is it all worth it? Sure. Gordon and I enjoy the challenge. And we love having fresh, full-of-life vegetables to eat and sell all winter. Have you ever noticed that carrots and greens are sweeter once cold weather arrives? It’s not your imagination. 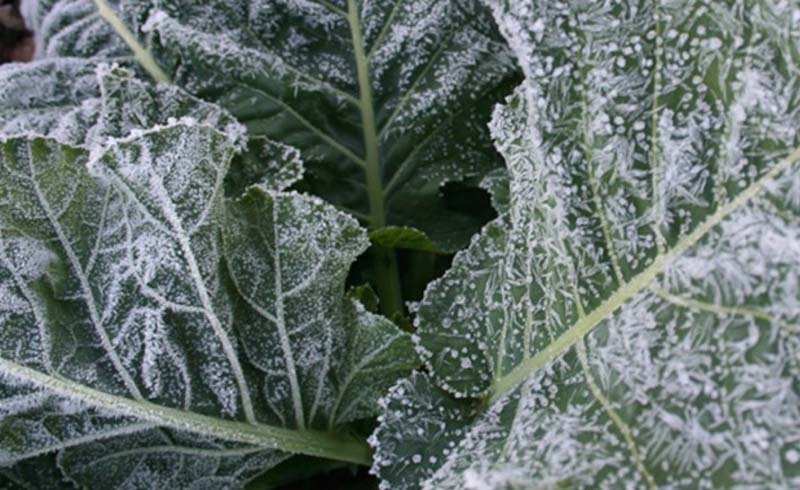 To protect themselves from the cold, plants convert some of their starches to sugars, to keep their cells from freezing (sort of like nature’s antifreeze). Plants convert starches to sugars to keep their cells from freezing. That's why the carrots Vera is digging up here are so much sweeter when it’s cold out. This winter, though, we’ll be missing those sweet carrots. Since we’re moving the farm to our new land, we won’t be growing any winter crops. It feels strange to be approaching winter without a farm full of vegetables, ready to be harvested. There’s nothing so reassuring as a hoop house full of sweet greens on a dreary December day. But our freezer is full of tomato sauce, our fridge is full of pickles, and we’ll make a big batch of sauerkraut before too long. And by this time next year, if all goes well, we’ll be carefully tending loads of vegetables for our first winter growing on the new land.